Written by Job on July 15, 2015 Blog, Product news, WooCommerce. Important update: As of August 2016, the SIDEKICK extension is no longer available for WooCommerce. However, you can still access the walkthroughs for WordPress and WooCommerce for free by visiting the SIDEKICK website or downloading the SIDEKICK plugin from WordPress.org. Please contact support if you have any questions about this change. Thanks for your understanding! At WooThemes, we believe in empowering users with our software. Together with our users and developers, we want to build the best possible eCommerce plugin with the best possible UX and UI. However, it’s not always easy for someone new to eCommerce to learn to use our plugin. We’re always aiming at making it easier to use WooCommerce, whether it’s through improving the onboarding process or creating helpful educational content. At the same time, we are aware that there is a lot to learn, especially if you are new to selling online. That’s why we’ve now teamed up with SIDEKICK to make WooCommerce walkthroughs available right on your store. With SIDEKICK, you can be fully trained on using WooCommerce and its extensions without ever leaving your office. Watch the video below for a quick overview, then keep reading to learn more about why we decided to partner with SIDEKICK, and how these new walkthroughs can help you sell online faster than ever before. We’ve invested lot of time in educating our users in how to use our software. A few months ago, Bob Dunn conducted a survey and found some results that we found very insightful in terms of our education strategy. Bob’s findings affirm our educational philosophy at WooThemes: we believe that people learn in different ways, and we want to cater to all of those different learning styles. We have always dedicated a lot of attention to our online docs, and continue to do so, but in the last year, we’ve also started emphasizing other ways of learning so we can cater to additional styles. First, our video vanguard has recently finished creating a series of WooCommerce 101 video walkthroughs. People who want to set up their WooCommerce store can now watch over 30 videos explaining in detail how to start and configure their store. Second, we’ve started facilitating WooCommerce Meetups worldwide to bring WooCommerce users together. This way, they can learn from each other and grow their WooCommerce skills in a comfortable, supportive setting. Third, we’ve started validating other providers in WooCommerce training. We’ve teamed up with some great educational partners who give excellent training in how to use WooCommerce. This training is offered online and 1-on-1, both individually and for groups. Finally, our WooCommerce project manager Patrick has even written a book on how to use WooCommerce! As you can see, we’ve aimed high at educating users. But we wanted to take things a step further. However, we felt like we weren’t always right there where the users are when they needed help. So that’s what led us to team up with SIDEKICK. The awesome team at SIDEKICK has made a plugin that you can install for free on any WordPress website. If you have WooCommerce installed on that website as well, you will be able to access the walkthroughs we’ve made just for you. What are the advantages of SIDEKICK? By far, the biggest one is that the training happens where your website lives. You don’t have to leave your website to learn about WooCommerce. We’re meeting you in your space. It’s the closest we can get to sitting down next to you and walking you through our products in person. If both WooCommerce and SIDEKICK are installed on your website, you can select all our walkthroughs. A second massive advantage is that our walkthroughs help you configure WooCommerce step-by-step. After you’ve gone through all the walkthroughs, your store will be ready to launch! It’s not just a theoretical explanation — these lessons actually get your site ready to release to the world. Finally, we teach you how to do it. It’s okay if we can explain a few things to you, but even better if you do them yourself. After each little step you take in the walkthrough, we’ll pause for a second and we wait until you’ve tried out the step yourself. This is the easiest way to learn a new tool: by trying the steps and experimenting with it yourself. If you develop websites for store owners, in most cases there comes a time where you hand over the website to your customer. At that time you will have to train them in setting up products, and making minor changes to the configuration as needed. Instead of going through a very long 1-on-1 with your client, or expecting your customer to read the equivalent of a book, you can now just install the SIDEKICK plugin and let the store owners learn about WooCommerce on their own time. It won’t cost you anything, and it will save you a lot of time and effort. In a couple of weeks we’ll have a blog post dedicated entirely to training customers when handing over a WooCommerce store that you’ve developed. Keep an eye out for that! SIDEKICK Walkthroughs wait for you to react before the lesson continues. As we’ve already explained, SIDEKICK for WooCommerce core is available now. But we are also looking into using SIDEKICK for our larger or more complex WooCommerce extensions. 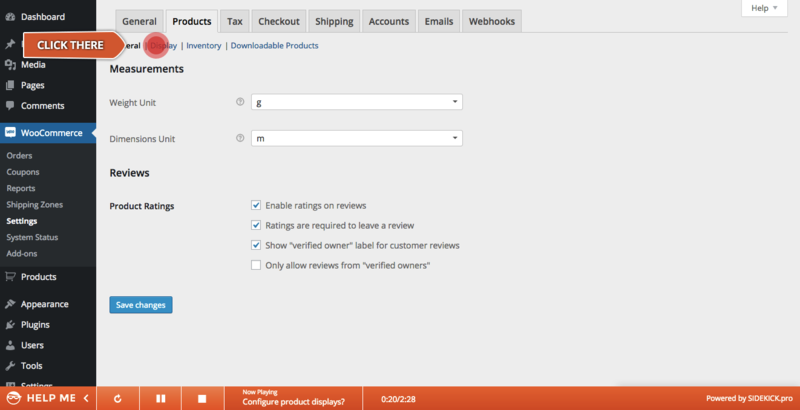 In fact, we’ve already released a walkthrough for the Table Rate Shipping extension. This extension is versatile, but challenging to configure. To combat that, a walkthrough has now been made available on SIDEKICK as well. If you have both Table Rate Shipping and SIDEKICK installed and activated on your website, you’ll get a step-by-step explanation on how to set up this plugin. If you’d like to see this happen for other extensions as well, tell us which ones and why. We would love to have your feedback! The collaboration between WooThemes and SIDEKICK is a new one. At the moment, you’ll find the first version of the walkthroughs online, and you can access them by downloading the SIDEKICK plugin here and installing it on your WooCommerce-powered store. We are fully aware that improvements are always possible. We’d love to hear from you about how we can make this new partnership even better, or what else we can explain in a walkthrough. If you’re keen to help out, just leave a comment below with some feedback or your ideas. As we already know, WooCommerce is only as great as its users. The better you become at using it, the better our software becomes. Thanks for all of your support and help! Hi Stuart, I’ll ask the SIDEKICK team to reply to that. Based on experience: if WooCommerce is network activated and SIDEKICK on only one of the sites, it will not work as it will not recognise the presence of WooCommerce on the site. (Yet.) It’s reported and the team is looking at it. I’m also interested in support for Multisite. If Sidekick works for multisite, then it can save me a lot of time. By the way, this is a great feature of both WooCommerce and SideKick. Thanks for making a great software. As you can read below, the SIDEKICK team has deployed it for networks as well! Yes it will, we’ve actually just added the ability to deliver walkthroughs for network activated plugins. We also provide a full SIDEKICK network admin area for mass management and deployment of SIDEKICK to the entire multisite network. Let us know if you if you have any other questions! Focusing on content like this is a really great way to call attention to the highest quality learning experiences possible for e-commerce, which is naturally now with WooCommerce. Can’t wait to see this same model applied to other, future WordPress based software, too! contextual help is always an asset. I had a quick look through Sidekick/Woocommerce and yes it is great but does not go into any real depth and explain why you should select one option over another. 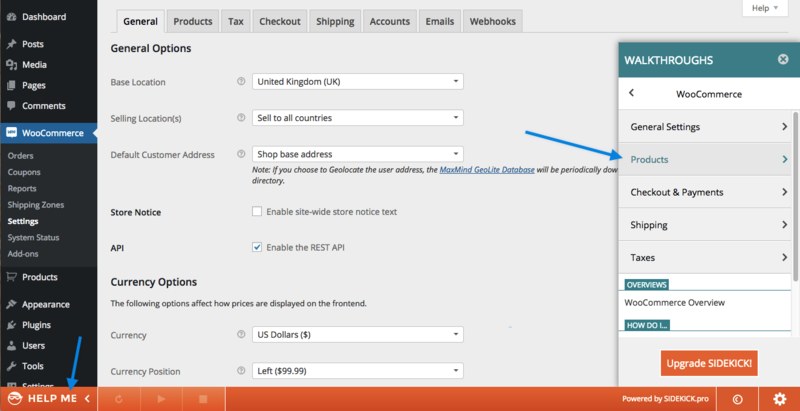 So it does not add a lot of real value as the same info is embedded in Woocommerce already via the ? along each field. To my mind more assistance with understanding actual configuration variables and implications if you choose one over another would be more beneficial. As we expend the library we’ll definitely focus more on those areas. There are definitely two aspects to effective teaching. Through a step by step process and by having the person fully grasp and understand the concepts. We’re definitely committed doing both. Hi Bob, we’ve tried to find a good balance between teaching beginners how to do things and why to do things, but this has just been the first attempt. We’re very open to input. What specific discussions did you have in mind? Focusing on TRS or the general one? a custom domain name, rather the URL will be [insertname].